NASA is ready to move forward with the development of the Space Launch System — an advanced heavy-lift launch vehicle that will provide an entirely new national capability for human exploration beyond Earth’s orbit. The Space Launch System will give the nation a safe, affordable and sustainable means of reaching beyond our current limits and opening up new discoveries from the unique vantage point of space. The Space Launch System, or SLS, will be designed to carry the Orion Multi-Purpose Crew Vehicle, as well as important cargo, equipment and science experiments to Earth’s orbit and destinations beyond. Additionally, the SLS will serve as a back up for commercial and international partner transportation services to the International Space Station. The SLS rocket will incorporate technological investments from the Space Shuttle program and the Constellation program in order to take advantage of proven hardware and cutting-edge tooling and manufacturing technology that will significantly reduce development and operations costs. It will use a liquid hydrogen and liquid oxygen propulsion system, which will include the RS-25D/E from the Space Shuttle program for the core stage and the J-2X engine for the upper stage. SLS will also use solid rocket boosters for the initial development flights, while follow-on boosters will be competed based on performance requirements and affordability considerations. 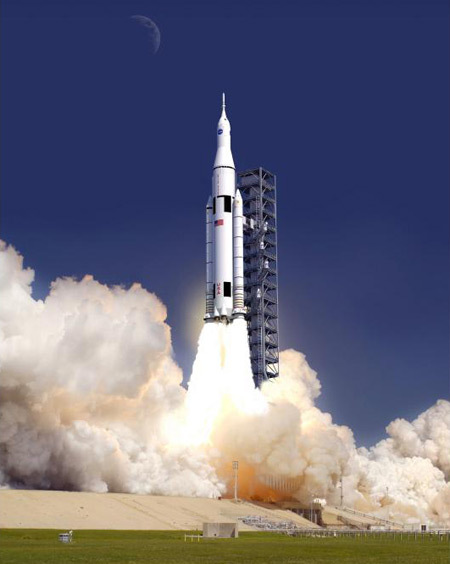 The SLS will have an initial lift capacity of 70 metric tons (mT) and will be evolvable to 130 mT. The first developmental flight, or mission, is targeted for the end of 2017. This specific architecture was selected, largely because it utilizes an evolvable development approach, which allows NASA to address high-cost development activities early on in the program and take advantage of higher buying power before inflation erodes the available funding of a fixed budget. This architecture also enables NASA to leverage existing capabilities and lower development costs by using liquid hydrogen and liquid oxygen for both the core and upper stages. Additionally, this architecture provides a modular launch vehicle that can be configured for specific mission needs using a variation of common elements. NASA may not need to lift 130 mT for each mission and the flexibility of this modular architecture allows the agency to use different core stage, upper stage, and first-stage booster combinations to achieve the most efficient launch vehicle for the desired mission. The Space Launch System will be NASA’s first exploration-class vehicle since the Saturn V took American astronauts to the moon over 40 years ago. With its superior lift capability, the SLS will expand our reach in the solar system and allow us to explore cis-lunar space, near-Earth asteroids, Mars and its moons and beyond. We will learn more about how the solar system formed, where Earth’s water and organics originated and how life might be sustained in places far from our Earth’s atmosphere and expand the boundaries of human exploration. These discoveries will change the way we understand ourselves, our planet, and its place in the universe. Projected cost for this system is $30 billion up through the first two flights, after which it is slated to fly once a year at a cost of at least $1 billion per flight. For the cost of those first two flights you could instead buy 300 flights of Falcon Heavy, not including Dragon, so maybe 200 or so flights with Dragon. Dragon is also designed to be able to “land on any solid surface in the solar system” which is not true of Orion. Is this any way to run a space program? It seems to me the Emperor has no clothes here. The best thing for a human future in space would be to cancel this program. 70-130 metric tons lifted at a rate of one or two flights per year by a throw away vehicle doesn’t sound like a keeper for either exploration or industry. The rationale doesn’t seem to me to represent either a sustainable pathway for permanent human presence beyond LEO or the high launch frequency necessary to start large economy-boosters like space solar. It does seem to represent a bureaucratic scramble to keep existing payroll going for constituents who would be better employed working a Gerard K. O’Neill – type rationale. Yep, ticks all the boxes for the key districts. Pork is go for launch.